California is blessed with prime coastal real estate, making a number of unique beach vacations possible. Whether you want to overlook the cliffs in Big Sur, plan a Central California wine country escape, or enjoy authentic Mexican eats near Baja, the coastline is filled with some of the best luxury beach hotels in California. The Montage in Laguna Beach has garnered a number of awards, including ranking in the 10 Best Beach Hotels in the World by Coastal Living. The Craftsman design of the Montage pays homage to Laguna Beach's early days as an art colony. The Montage, Laguna Beach, is close to area attractions like Temecula wine country, the Del Mar racetrack, and even Catalina Island. Those traveling with kids could conceivably even plan a day or two at Disneyland and still enjoy the luxurious beachfront retreat. Accommodations: Signature elements in rooms include marble bathrooms with deep soaking tubs, feather-top bed with Egyptian linens, Egyptian towels and bathrobes, and a private balcony. One-bedroom suites offer partial garden/ocean views with over 1,000 square feet of space. The suites include free standard-speed Internet, while high-speed Internet is $19.95 per day. Activities: Enjoy the stunning Mosaic Pool wherein you can rent poolside cabanas for $200 per day ($300 between Memorial Day and Labor Day), which includes Dyson bladeless fan, iHome with games, newspapers and magazines, Coola organic sunscreen lotion, and complimentary beverages and fruit. Cost: Sample rates for Ocean Coastal King rooms start at $1,095. The Catalina Suite starts at $7,500 per night. 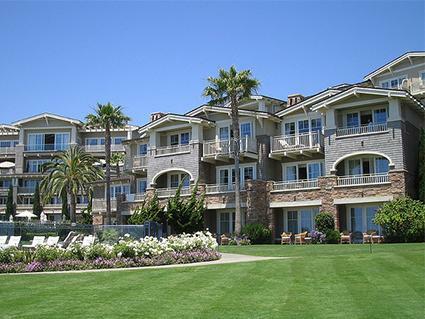 L'Auberge Del Mar is a luxury hotel between Los Angeles and San Diego, in the prestigious Del Mar region. Del Mar is an ideal mid-way point for those looking to combine the best of Los Angeles, Orange County, and San Diego. Awards for L'Auberge Del Mar include Travel + Leisure's Best Beach Hotels in 2011, and the #6 Hotel for San Diego in Best Hotels from US News. Accommodations: L'Auberge Del Mar's guest rooms include Barclay Butera decor, and a range of amenities like full marble baths, bathrooms, in-room digital safes, and fully-stocked refreshment center. If you're traveling with your dog, L'Auberge has a petite pooch policy. Activities: The hotel features a year-round heated pool overlooking the Pacific Ocean. There's a footpath to 15th Street Beach as well. Once you leave the property, you'll find you're close to Del Mar Fairgrounds, the San Diego Polo Fields, San Diego Zoo, Balboa Park, San Diego Safari Park, SeaWorld and LEGOLAND. San Diego is home to a number of amazing craft breweries, while Temecula wine country is accessible as you head northeast. Cost: Sample rates for Village King with Fireplace start at $519 a night while Pacific Suites are $1,644 a night and up. 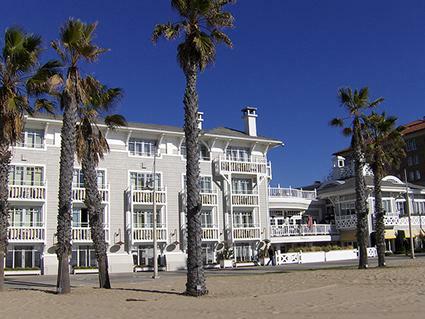 Shutters on the Beach in Santa Monica is one of only two Los Angeles hotels that are actually right on the beach. It's won numerous awards and topped prestigious lists like Oyster's Best Luxury Hotels in Los Angeles. Accommodations: Rooms are classic and comfortable, including high-end touches like Tibetan rugs and a whirlpool tub with its own television. Suite amenities include transportation to and from three airports and complimentary access to the house car. Activities: Enjoy the on-site spa as well as wellness-oriented outdoor activities such as outdoor yoga classes (on the beach!) and surfing lessons. One of the coolest features of the Shutters on the Beach website is the neighborhood picks section. Notable writers, the hotel general manager, and even the VP of Public Relations for the Los Angeles Lakers weigh in on their favorite spots around the hotel. Cost: Sample rates range from $621 per night for a superior room with king bed to $4,500 a night for the Presidential Suite. Terranea is an oceanfront resort that is a bit off the beaten path up in Palos Verdes, a cliffside location in Southern California. Once you see the views, you'll understand why it's won a number of awards, including being named one of Fodor's Travel Top 100 Hotels. The Spanish-Revival-style resort sits on 102 terraced acres overlooking the Pacific Ocean and is perfect for either a romantic getaway as well or a luxury family vacation. Accommodations: All guestrooms feature private balconies, stone bathrooms with separate bathtubs, pillow-top beds and high-end linens. Luxury suites can either be oceanside or feature an ocean view, which can be expanded into a two-bedroom suite for family travelers. For something even more luxurious, consider the bungalows, casitas or golf villas. Activites: Terranea features a nine-hole (par 3) golf course and even a separate adults-only pool. Additional activities at the resort include stand-up paddle boarding, kayaking, snorkeling, guided bike rides, horseback trails, or even a visit to the falconry program. Cost: Sample rates start at $545 a night for standard rooms, while suites start at $1,250 a night. The Biltmore Santa Barbara, a Four Seasons Resort, is Santa Barbara's only Five Diamond AAA property. 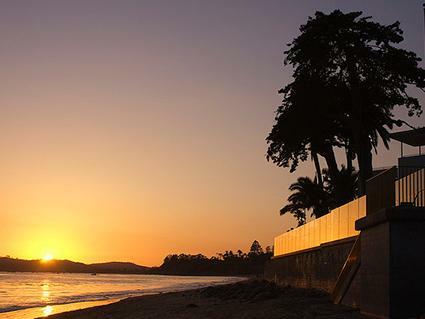 Santa Barbara is an ideal beach vacation destination, with a mild year-round climate and easy access to a variety of coastal activities and premier wine country. February through May is when gray whales pass through the region so whale watching is an option in Santa Barbara as well. Accommodations: This Spanish-Colonial-style resort features 207 rooms and suites, including 12 single-story cottages at the rear of the resort. Some of the rooms and suites include a separate shower/tub and views options range from garden, courtyard, or partial ocean view. Activities: On-site activities range from couples spa treatments to family-centric options and a "Kids for All Seasons" program. Exclusive activities you can book at The Biltmore Santa Barbara include volleyball training with two-time Olympic champion Todd Rogers and learning to surf with world champion Tom Curren. Cost: Sample rates start at $1,345 a night for a premier room and $1,920 for a one-bedroom suite. 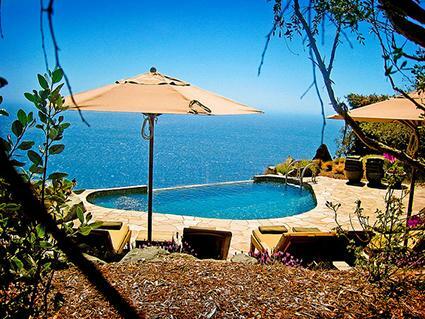 The Post Ranch Inn in Big Sur is a favorite amongst travelers and travel experts. Mr. And Mrs. Smith even named it Best Smith Hotel in 2013, while Travel + Leisure included it in the 500 World's Best Hotels for 2015. Post Ranch Inn was #1 in California, #5 in the US, and #13 in the world. It's important to note this is an adults-only hotel, with no one under 18 permitted. Accommodations: The scenic Post Ranch Inn overlooks the cliffs at Big Sur and features 39 guestrooms and two private homes. Room amenities vary by particular room choice. Cliff Houses feature wood-burning fireplaces, heated floors, indoor spa tub, outdoor stainless steel hot tub, robes, walking sticks, binoculars, and more. Smaller Butterfly Rooms face the mountain and include the fireplace, walking sticks and binoculars as well. All rooms and houses include complimentary Wi-Fi. Activities: Guests of Post Ranch Inn can take part in a wide range of resort activities, including restorative yoga, guided nature walks, an edible tour of the chef's garden, star gazing, and the use of on-site Lexus vehicles. There are two cliffside heated infinity spas and a heated swimming pool. Venture beyond the resort to popular area attractions or up to Carmel or Monterey. Big Sur has numerous hiking trails and beaches worth exploring as well. Cost: Sample rates start at $1,225 for the Tree House or $1,775 for the Peak House. 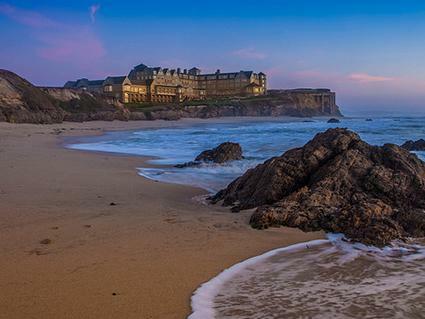 One of the iconic elements at The Ritz-Carlton, Half Moon Bay is its ocean-view fire pit where you can relax, watch the sun go down, and enjoy some of Northern California's award-winning wines. The Ritz-Carlton brand wins numerous awards for its signature luxury properties, and The Ritz-Carlton, Half Moon Bay, has claimed several, including America's 2014 Golf Resort of the Year. Accommodations: Guest room amenities include feather bed, duvets, and 400-thread-count Egyptian cotton sheets, marble bathroom with separate shower and tub, terry robes, laptop safe, and 24-hour room service. Activities: The Ritz-Carlton, Half Moon Bay has a heated indoor swimming pool, coastal jogging and biking paths, six-lighted tennis courts, and on-property championship golf courses. Area activities are plentiful - explore the coast, walk the historic Main Street, pick pumpkins, or wander among the massive California Redwoods. Cost: Sample rates start at $825 for a Terrace Fire Pit room, while The Ritz-Carlton Club Level rooms start at $905. If you're looking for unique lodging in San Francisco with ocean views, consider Cavallo Point. Cavallo Point is a member of Historic Hotels of America and has been racking up awards for 2015, including winner for "Sense of Place" in National Geographic World Legacy Awards, and #1 in San Francisco, #6 Best Hotel in California, and #25 Best Hotel in the U.S. in Travel + Leisure's World's Best Awards. Accommodations: You can stay at Fort Baker, a former US Army post, in former officers' residences that have been restored. Contemporary rooms sit above Fort Baker and offer impressive views of San Francisco Bay and the Golden Gate Bridge. Activities: Complimentary activities include a guided hike under the Golden Gate Bridge, guided Fort Baker historical walks, morning yoga, and various other special events. The real highlight is the Cavallo Point Cooking School, rated #1 Hotel Culinary School by Gayot. There is a constant rotation of cooking classes and programs available to sign up for during your vacation. Cost: Sample rates: Contemporary and Historic room rates start at $499 per night. With a temperate year-round climate, a beach vacation to California is an option any time of the year. With a range of luxury beach hotels in California catering to different types of clients, you're bound to find the perfect resort - whether you're traveling with your significant other for a romantic weekend getaway, or going on your family summer vacation when the kids are out of school.